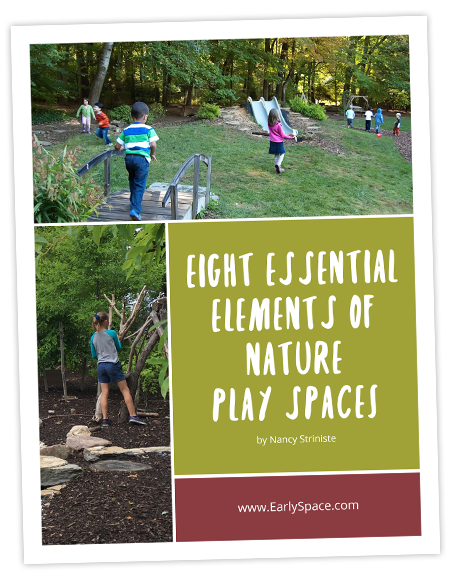 Nancy Striniste, founder and principal designer at EarlySpace, is a landscape designer, an educator, and an author. Nancy’s passion is for creating spaces that nurture and heal—both the earth and the people on it—spaces that draw people outside, connect them to nature and nourish their souls. With a unique background in both children development and design, Nancy has been creating spaces for children for more than three decades. 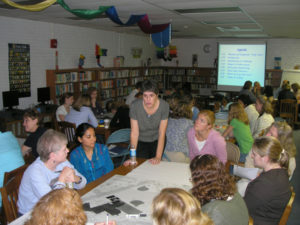 She began her career as an early childhood educator in the 80’s. Her creativity and innovation in her own classroom led to presentations for other teachers which led to her first design projects. She’s been creating spaces for children and teaching teachers about the potential of the physical environment ever since. Her designs have won awards from the Metropolitan Council of Governments, the Chesapeake Stormwater Network, the Maryland Recreation and Parks Association, and the Landscape Contractors Association of MD, DC and VA.
Nancy is the author of Nature Play at Home: Creating Outdoor Spaces that Connect Children to the Natural World (Timber Press, 2019) 250 pages of ideas, information, inspiration– with hundreds of photos and gorgeous illustrations. 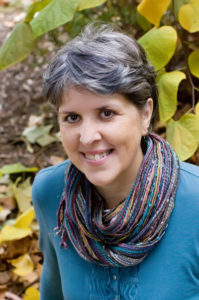 In addition to her design work and writing, Nancy teaches a class called “Landscape Analysis and Design for Nature Play and Learning” at Antioch University New England in their graduate program in Nature-based Early Childhood Education. Nancy is a certified Chesapeake Bay Landscape Professional. EarlySpace is a registered Virginia SWaM (Small Women and Minority Owned Business. the International School Grounds Alliance, where she loves learning from and being inspired by the creativity of colleagues from around the world. She brings a deep understanding of both sustainable landscape design and child development to each project. She earned her master’s degree in Sustainable Landscape Design from The George Washington University, and a BS in Education from Wheelock College. She studied design and children’s spaces at the College of Design at North Carolina State University. In the 90’s she and her family were founding residents of Arcadia, a sustainably designed child-friendly cohousing community in Chapel Hill, North Carolina. 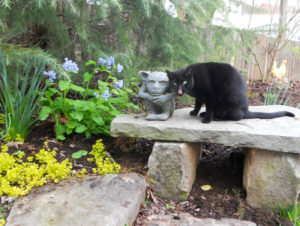 She now lives under the first residential green roof in Arlington, Virginia with her husband and one very large cat. She loves working in her own garden and experimenting with plants and design. As a mom she volunteered at her children’s schools from preschool to high school to create natural playspaces and school gardens. She has been a preschool co-op parent, a PTA member, a Girl Scout leader, and a band parent. She currently enjoys her empty nest and traveling, including visiting her grown children who are out in the world doing amazing things.